I mentioned here that I was working on changing up a chest of drawers that I purchased on Craigslist. I had it primed and ready for paint. Over the past week, I was able to get several coats of paint onto the frame and drawers. Once I had 2 coats of paint on each piece, I added a coat of acrylic. 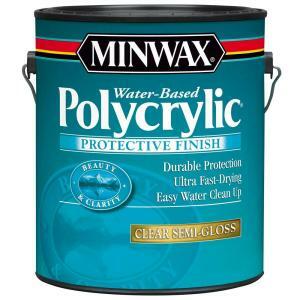 I used Minwax Polycrylic in Semi-gloss. I let it sitting in the garage for about 48 hours before taking it upstairs. It was pretty humid outside so I wanted to make sure the paint and acrylic really hardened before putting it in its home. Mathlete still insisted on keeping the cardboard underneath so we are doing it up super fancy in the guest room right now. I had breifly thought about painting the hardware that came with the chest but then I saw the hardware you see in the pictures above on the clearance rack at Target. I just couldn’t resist.